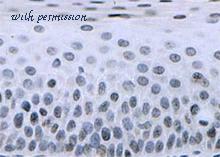 Immunohistochemical detection of CENP-A on paraffin embedded section of a squamous epithelium of human tonsil. Western blot analysis of Jurkat (1), Raji (2), PC12 (3), Rat-1 (4), WR19L (5), C2C12 (6), and NIH3T3 (7) cell lysates probed with CENP-A mAb (3-19). 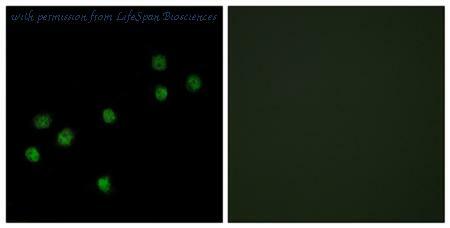 Immunofluorescence analysis of HepG2 cells, using Centromeric Protein A Antibody. The picture on the right is blocked with the synthesized peptide. 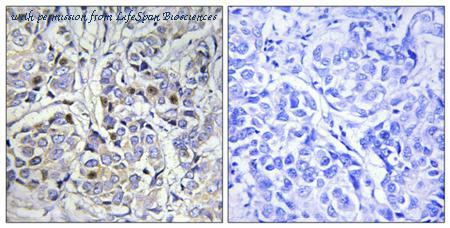 Immunohistochemistry analysis of paraffin-embedded human breast carcinoma tissue, using Centromeric Protein A Antibody. The picture on the right is blocked with the synthesized peptide. 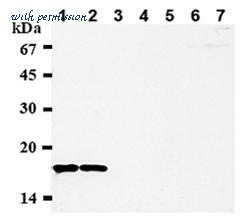 The CENPA antibody from Proteintech is a rabbit polyclonal antibody to a fusion protein of human CENPA. This antibody recognizes human antigen. 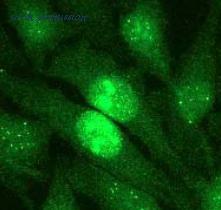 The CENPA antibody has been validated for the following applications: ELISA, WB analysis.